Sailing Wind statistics provide information about shift size and length. Sometimes you have to tack, and sometimes you want to gain from a shift (see Tacking). When you tack, you lose distance to weather. If the shift isn’t big enough or long enough, you won’t gain back your distance lost before it shifts back. The two things that are important in your decision are how well you tack (see Tack Scoring), and whether or not the wind shift you are tacking into will be big enough and last long enough to make back your investment (see Break-even Tacking.). It would be nice if wind shifts were metronomes, always so many degrees for so long, but of course they aren’t. You can decide about the shifts by looking at a stripchart, but that takes time and is prone to error and wishful thinking. And it also presupposes you have a stripchart of the true wind speed and direction. 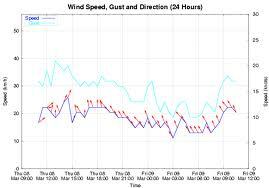 Ockam provides a set of real-time reporting tools for sailing wind statistics. Here you see the wind statistics report on the race page; 5 minutes of history; average speed of 12.3 knots; average wind direction from 212° shifting ±3°; persistent shift 7°/hour to the right; shifts average 6° and last 42 seconds. If you check break-even tacking, you will see you shouldn’t tack for mere gain, or you will lose. Sailing Wind Statistics are a feature of Ockam Instruments that is not available for other sailing instrument providers.